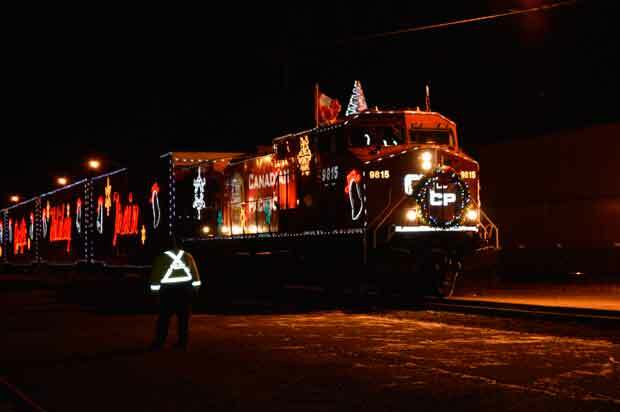 The CP Holiday Train arriving in Thunder Bay in 2013. THUNDER BAY – The Canadian Pacific Holiday Train has been rolling across Canada for twenty years now, bringing music, colourful lights and support for the local food bank to communities across North America. Last night the train rolled into Thunder Bay and entertained a large crowd of enthusiastic people. Canadian country music legend Terri Clark headlined the entertain the crowd. Over the twenty years that the CP Holiday Train has been helping ring in the season, it has helped raise $14 million and gather 4.3 million pounds of food. The train arrived at the old CP Syndicate Avenue Station in the city and gave crowds a real close up view of the train.